We at The Bombay Store have decided to give you a happy high on your favourite day Sunday and make it extra special for you. With our one of a kind of initiative, ‘The Bombay Store’ presents to you ‘Happy Sundays’ – The most happening event in town at our flagship store at PM Road, Fort, Mumbai. Bumper prize – Win products worth Rs.5000 free. C) The event will also have the display of distinctive products by various brands providing a perfect platform for visitors to choose from a variety of products. Could we add more spark to your Sunday? 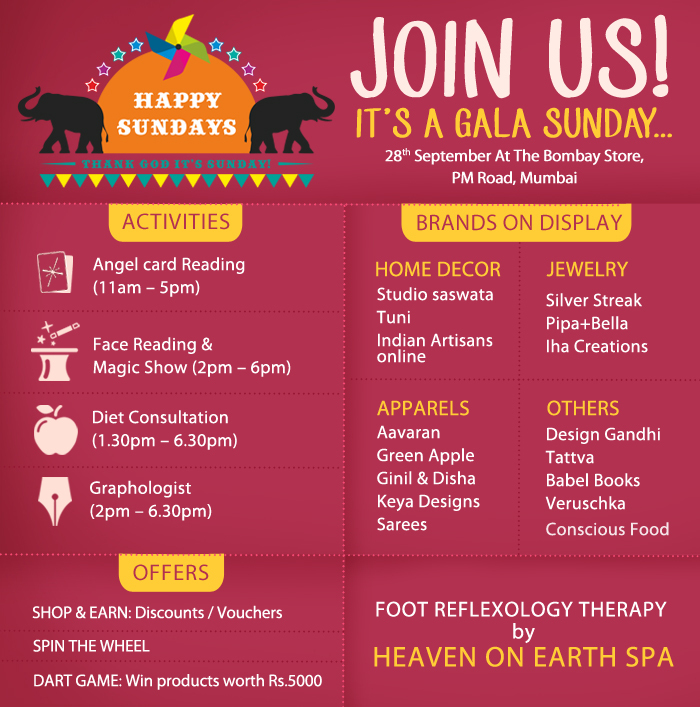 Do celebrate a Gala Sunday this 28th September at The Bombay Store! See you there!